A typical week usually involves several visits to the market; it's something I truly never recovered from after a brief stint living in Europe. I don't like deciding a week's menu beforehand... as I never really know what will sound good a few days down the road. I like to figure out what we're having for dinner based on what sounds good (now) and what looks good (now) at the market. At best I might be able to cobble together plans for two meals... maybe three... on a good visit. And if things get busy... like they have lately... this whole scenario kind of goes straight out the window and my efforts to put something edible on a plate get tested by just how well-stocked our fridge and pantry really are. Sometimes it's pretty, other times not so much. We have two tomatoes, three olives and a loaf of bread. How does a very barren bruschetta sound for dinner? These little tuna-potato cakes are very much a product of this bruschetta-making mentality. Only in this real life scenario there were two cans of tuna, a couple of potatoes and a whole heap of beautiful little tomatoes. First of all, tomatoes are so outrageously delicious right now that they could possibly be eaten on an old, leather shoe sole and be fantastic; particularly the heirlooms. Thankfully we had tuna and some fresh fixings. These little tomatoes are beautiful (in addition to being delicious), varying from brilliant yellows and mango-orange to fire engine red. They are sweet, juicy and vibrant, requiring little more than a light sprinkle of salt and pepper... if that. The tuna-potato cakes? Well, it's canned tuna amped up just a bit with a little mashed potato, fresh parsley, and sautéed shallots and celery. The mashed potato helps the patties hold their shape and just a light dusting of bread crumbs helps them get their bronze on during a very light skillet browning. The only side bar here is: get the best tuna you can... it makes a difference. (I used Fishing Vessel St. Jude White Albacore Tuna - Natural... it's US troll caught, has no added salt, and tastes delicious right out of the can). The cakes get topped with a cap of juicy, summer-sweet little tomatoes mixed with crisp, fresh cucumber and some punchy red onion. 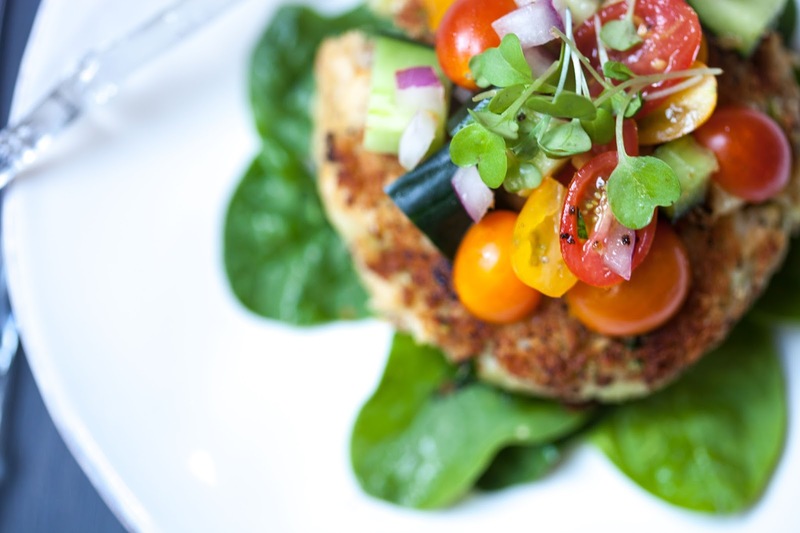 You can plate it with a little base of dressed spinach greens or a whole heap of salad greens. Either way, keep the tomatoes close by to generously add over top. The cakes form up well but should be handled with care while coating with bread crumbs. And a little care taken while they're in the skillet will ensure they plate whole and beautiful. If you want a bit more contrast in flavor, I'd suggest adding some marinated artichokes hearts, red pepper and/or jalapeño. Heat 1 tablespoon olive oil in a skillet set over medium heat. Add celery and shallots to skillet and sauté until somewhat translucent, about 5 to 8 minutes. Transfer mixture to a large bowl and add drained tuna, mashed potato, and parsley. Mix well to combine. Season with kosher salt and black pepper, to taste. (Add additional fixings, as per note, if preferred.) Divide and form mixture into six cakes. Pour bread crumbs out onto a flat plate. Carefully place one cake on bread crumbs and sprinkle and press crumbs onto cake. Gently turn cake over and repeat, until cake is well coated with crumbs. Repeat process with remaining cakes. Heat remaining olive oil in a large skillet set over medium high heat. Arrange six cakes in skillet, without edges touching. Sauté for about 1 to 2 minutes, then carefully turn each over and brown other side for about 1 minute. Set aside. Meanwhile, combine tomatoes, cucumbers and red onion in a bowl. Drizzle lightly with extra virgin olive oil and fresh lemon juice. Season with salt and pepper, to taste. Set aside. Arrange greens on plates (dress with additional olive oil and fresh lemon juice, salt and pepper, if desired). 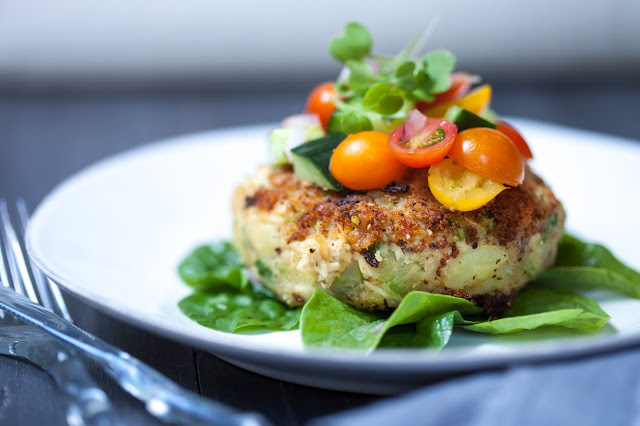 Top greens with a tuna-potato cake and cap with a generous spoonful of tomato-cucumber salad.